Not too long ago we were both shopping in Boots and came across a new set of nail polishes. 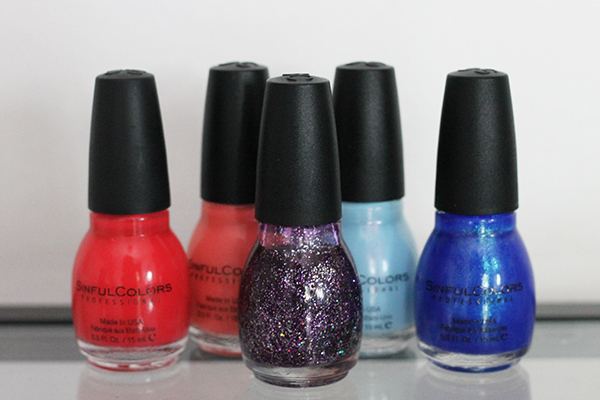 The Sinful Colours Nail Polishes have been a hit in the US but they've made their way over to the UK. For any nail polish obsessive, to get high quality nail polish at £1.99 each is pretty much unheard of and with such a great choice of colours, you can’t blame us for wanting to stock up on a few! With pretty much all nail polish collections you find ones that work amazingly well and others not so much so I thought I'd share the ones I've picked up recently and how I got on with them. I love that they chose the name Cinderella for this polish as it’s the perfect Cinderella blue, though sadly the polish doesn't live up to it. The colour looks gorgeous in the bottle with the baby blue and a subtle purple shimmer much like the way Essie’s Bikini So Teeny looks but the formula doesn't do the colour justice. I tried putting it over white nail polish and on its own but it ends up looking like a big gloopy mess sadly. I won't be picking this one up again but at least I know which colours would be safer to pick for next time. Thankfully Blue By You did not disappoint, it’s a great quality nail polish. Although it’s from the same shimmer collection as Cinderella, the formula is much easier to work with and it gives off a sort of mermaid-ish colour with the green tones running through it when it catches the light. If you fancy trying one of the shimmers, the darker colours will probably apply much better than the lighter ones. Aside from the strange name choice, I Miss You is a lovely purple with a ton of silver glitter running through it. One of my pet peeves about glitter nail polishes is when they have clear nail polish with glitter instead of a colour with the glitter but I Miss You has a purple colour which is great. The colour is very sheer so you do need about 2-3 coats to get it right but it never seems to look too thick or gloopy with all the layers so it’s the perfect consistency for layering. When it was finally beginning to look like summer I went straight to boots to pick up some summery shades and came out with Timbleberry, which is a lovely hot pink shade. Out of the Sinful Colour nail polishes I have, I'd say this applies more opaque than the rest and I can easily get away with a single coat. I also found it lasts really well on the nails and it’s probably the reason I went back for more! To finish off my summer beauty picks, I picked up Island Coral which is a lovely light pink coral shade. It reminds me a bit of Benefit’s Coralista, they'd be the perfect match! Much like Timbleberry the quality was great and usually pink shades are very hard to get right so I was really happy to find a pink which won’t go gloopy or too sheer. If I had to choose my favourites out of the 5 I’d have to go with Blue By You and Timbleberry as they seem to be the most reliable in terms of application and wear but I can definitely see myself picking up more on my next beauty spending spree.